Just poppin’, or should I say “hoppin'” in to share a card today. Aren’t these bunnies (Mama Elephant) absolutely adorable? I just got the yummy Distress Oxide inks last week and have been trying them out. I used a blending tool and Distress Oxide ink in Wilted Violet and Worn Lipstick on smooth Bristol paper to make this dreamy background. The ink blends so smoothly – I was able to blend it much better than regular Distress Inks. 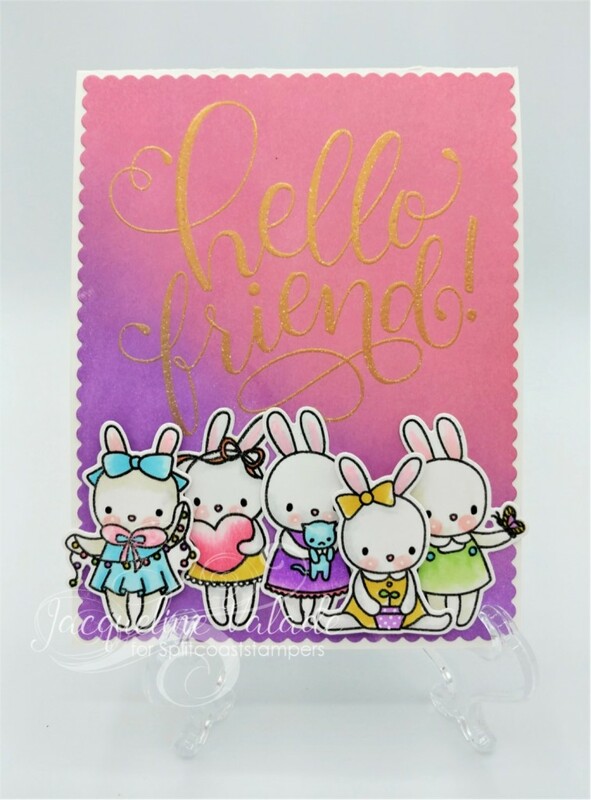 All the bunnies were stamped on Crafter’s Companion Spectrum Noir Ultra Smooth Paper (SNUSP), colored with Copics and cut out with matching dies. The greeting was stamped using Versamark then heat embossed with gold embossing powder. I am certain these Distress Inks will be getting much use. I will be keeping an eye out for the next set of colors to be released.